– Doing lunges in the parking lot and realizing that the car I’d been strutting back and forth in front of was not, in fact, MY Wanda the Honda CR-V, but another light blue CR-V that just so happened to be occupied by a rather appalled looking elderly couple. – Eating taco salad in bed. Seriously. I do not advise. – My new package of gum says, “Now Flavor Charged!” … what was it before? Flavor Devoid? 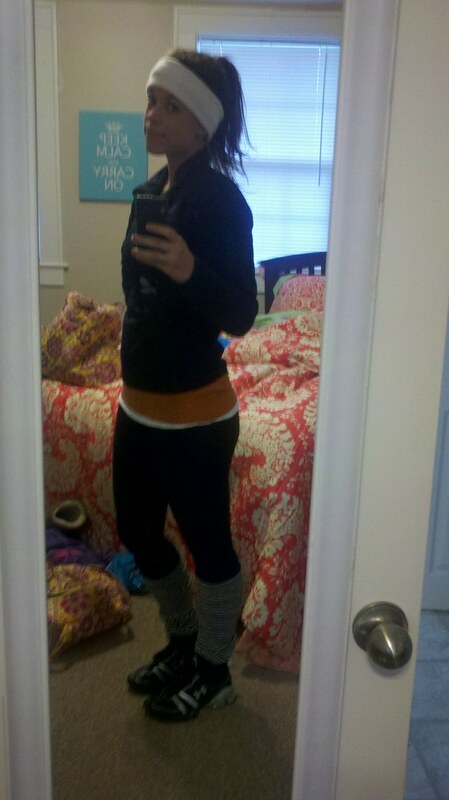 The photo doesn’t really do any justice for my black leggings and navy blue/white striped leg warmers. – Mike’s coming to visit this weekend. – The fact that I haven’t actually been shopping since 2010. Awkward: The fact that I’m still ALWAYS broke. – Every day graduation gets closer. I can SMELL my diploma. Haha – taco salad is amazing. I would definitely eat it in bed.. despite awkwardness. Agree the running outfit is definitely awesome! haha I'm sure the elderly couple thought you were crazy…I do ridiculous stuff on accident all the time. Talking to myself in public has proven to get some stares. I advise against it. I don't think it's ever a good idea to eat food in bed… I always end up rolling around in crumbs!